Itumeleng Khune acknowledged that Kaizer Chiefs’ defence let them down in their Soweto derby loss against arch-rivals Orlando Pirates, and says that it’s something that they need to fix. The Glamour Boys took an early lead in the Soweto derby against their rivals as Khama Billiat tapped home after a Siyabonga Mpontshane error in the 15th minute. Chiefs then gave away a penalty, which was saved by Khune, before Innocent Maela and Vincent Pule struck in the 29th and 32nd minutes respectively to seal the three points for the Buccaneers. Speaking to the media after the match, Khune admitted that his side failed to keep their defensive structures despite the keeper doing his best to organise them during the loud atmosphere created by a near-capacity crowd. ‘I tried to communicate with my back four, but we didn’t stick to the assigned positions when we conceded the first goal. We must rectify and move forward,’ said the Amakhosi skipper. 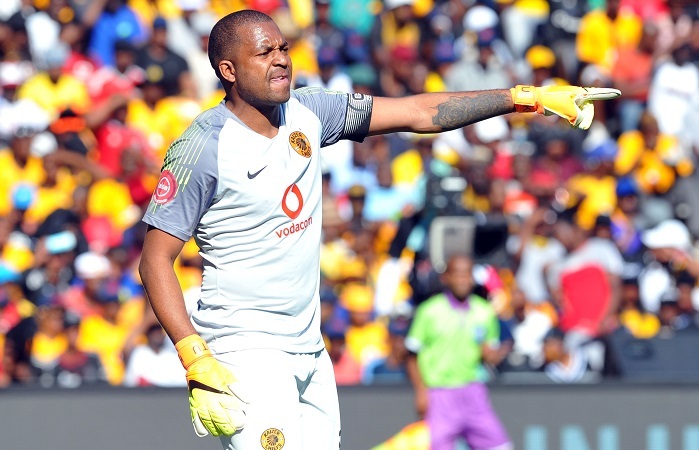 Khune, however, was quick to defend coach Giovanni Solinas’ selection of Ramahlwe Mphahlele, Mario Booysen, Siyabonga Ngezana and Godfrey Walusimbi. ‘There is no difference in terms of whoever is playing in front of me at centre back. We are working on combinations and we all played because we have a big squad with good players – everyone is getting a chance to play. ‘We disappointed our fans. We wanted our fans to have something to take home, but we didn’t give them the bragging rights,’ added Khune. Chiefs will next be in action when they come up against SuperSport United in the Telkom Knockout quarter-finals on Sunday at 3pm before returning to league action against Black Leopards.